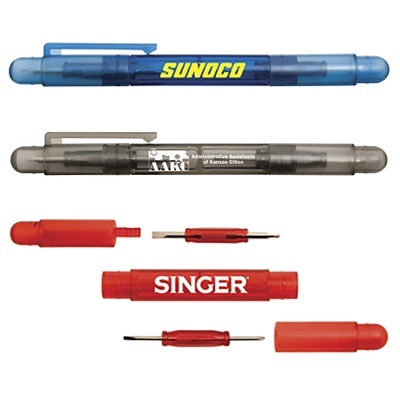 Promotional screwdrivers with your custom message imprinted are a useful and long lasting advertising tool that everyone appreciates. Promote your name or business with personalized advertising imprinted on one of our many screwdriver or other promotional tools. Give us a call at: 706-374-0710 - for a Free quote and assistance in selecting the best screwdriver or other customized tool for your promotional needs. This convenient 4-in-1 pen-style pocket screwdriver is a multi-purpose tool sure to please everyone with your advertising printed on it. Double-ended "pen" design fits smoothly into shirt pockets. Includes two sizes of dual-ended bits (slotted/ Phillips). Handy pocket clip on plastic body. Available in three color options: red, blue or smoke. Pen Style Promotional Screwdriver is 5.25" long x 0.63" wide. Imprint area on barrel is 1.75" long x 0.69" high with optional second side imprint (for an additional charge). For pricing on multiple locations or more than 1-color, please contact us for pricing.